Anaco recently hosted the annual McWane Group Safety Managers’ Conference at their manufacturing facility in Corona, California. Ross Boeker is the Group Safety Director (GSD) for this group which includes, AB&I, Anaco, Tyler Coupling, Bibby Ste Croix, Bibby LaPerle and Amerex. This annual meeting is a great opportunity for GSDs to get together with their entire team of safety managers to share ideas and best practices with each other and discuss current issues and challenges. This year’s agenda included a 1st quarter safety plan review, a best practice sharing WebEx with Kennedy Valve, an HR segment led by Joe Maziarz (Group HR Director) and Kevin McCarthy (VP HR), and a group tour of the Fender Guitar factory in Corona, California. The team was treated to an in-depth tour of the facility which manufactures the famous Fender Stratocaster and Fender Telecaster guitars, as well as the Fender Precision Bass & Fender Jazz Bass. After the tour, the team met with the Fender safety team to share ideas and best practices. Anaco safety manager Larry Fuscher offered and is looking forward to hosting the Fender safety team for a reciprocal visit in the near future. We are pleased to announce the winners of the 2017 McWane EHS Awards! Anaco held an Open House on October 4 for team members and their families. The 300+ attendees were treated to plant tours, delicious food, lots of fun games and music from many different eras. It was a great opportunity for families to tour the facility and have a little fun together. Everyone had a great time. Congratulations to the winners and to all of the facilities and team members who participated in this year’s competition. Do you know what your key result area (KRA) is? It’s the things that you absolutely, positively must do to fulfill your responsibilities and achieve your goals. Tyler Pipe & Coupling in Marshfield, Missouri hosted a KRA event for representatives from AB&I, Bibby Ste-Croix, Anaco, Tyler Pipe and New Jersey this week. Guests spent the day in the plant working with their counterparts. The goal of these events is to make it easier for team members at different facilities to reach out to each other with questions or problems. When AB&I started the MPG/KRA shared culture about five years ago, Kurt Winter wanted the team to learn more about the culture, processes, best practices, etc. at all of the McWane plumbing group facilities. They started by having the HR Manager’s visit each other’s facility once every quarter. They then expanded to have 2-3 team operational team members visit the facilities once a year with the same objective. Tyler Pipe in Marshfield was the last facility for this round. Next year, they plan to take it to the next level with key hourly team members visiting the facilities once a year. Guests enjoyed several teambuilding events at the recent event which included a jeep drawn tour of Fantastic Caverns then it was on to the Branson Scenic Railway for a two hour train ride through the rolling hills of Missouri and Arkansas. They ended the day with dinner at the Level 2 Steakhouse near the Landing in Branson, Missouri where they discussed the day’s events and enjoyed a wonderful meal. The McWane family of companies is an amazing amalgamation of four pipe facilities, four valve and hydrant facilities, seven soil pipe and utility fittings facilities, seven tank manufacturing facilities, one fire extinguisher facility, and five technology companies. The diversity and variety of product lines and business practices are certainly broad, but we all share an amazing amount of commonalities. Recently, Tyler Pipe had the opportunity to share their practices, culture, and expertise with team members from other McWane facilities in the Plumbing Division. About three years ago, Alan Boscacci suggested that each of the facilities within the Plumbing Division take turns hosting their sister companies and sharing their knowledge, skills, best practices, and unique cultures. Initially HR team members attended the meeting, but that was eventually expanded to include the production team. Tyler Pipe was proud to host representatives from Bibby Ste-Croix, Anaco, AB&I, and Tyler Couplings this year for the third annual meeting. 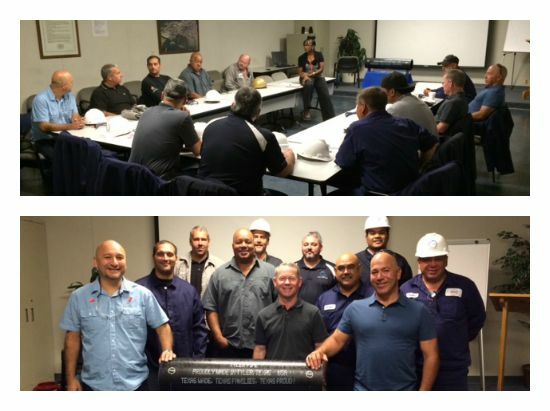 Everyone was given a guided tour of Tyler Pipe and the opportunity to visit specific areas of interest that pertained to their every day job duties including Production, Maintenance, Customer Service Representatives, and Shipping. Did you know that stretching can prevent repetitive motion injuries? A few years ago, Anaco researched how they could prevent injuries in jobs with the highest levels of repetitive motion. After much discussion about the best way to address the problem, they instituted a stretching program where team members stretch for 2 minutes at the top of the hour throughout their shift. 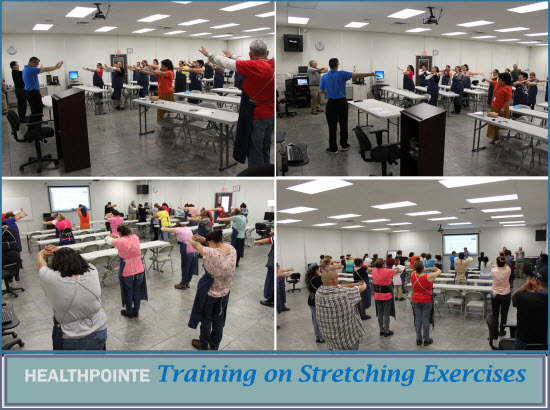 We are happy to report that these stretching exercises have helped reduce and almost eliminate repetitive type injuries from these departments! Anaco recently decided that it was time to “refresh” the stretching program. If you’ve ever tried to stick to an exercise program, you know that doing the same exercise every day can get boring, make you quickly lose interest, and even no longer challenge you as your body begins to adapt to the repetitiveness. To avoid this, Anaco brought in a physical therapist from a local clinic to observe how team members perform their tasks and recommend stretches that would best prevent injuries. After the initial observations, the entire team came together in the training center in groups for a hands-on demonstration and practice of some new and improved stretches. Great job, Team Anaco! Way to be proactive! Comments Off on Did you know that stretching can prevent repetitive motion injuries? 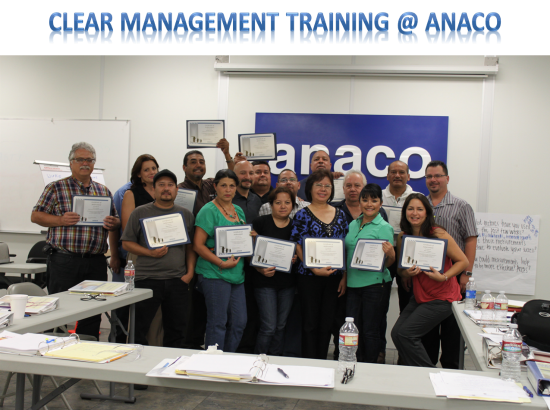 Anaco has been conducting Clear Management Training since March 2014. Managers, Supervisors, and Leads are interacting and exploring alternative ways to address items that affect the business such as employer and team member relations. The goal for this group is to improve their communication skills across the Team. 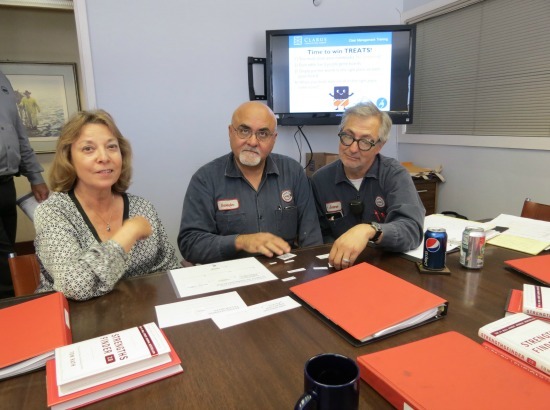 Group HR Director Joe Maziarz also made a trip to AB&I to help them facilitate their Conflict Management Training. The Anaco Team is excited about the Clear Management Training and can’t wait to use the skills they have learned during this training! We are pleased to report that 17 team members concluded their training on September 16! Management training is essential to the success of a business and team members with leadership responsibilities have extensive duties, from handling employee relations to making sure the business remains profitable. Since management responsibilities are complicated, and not exactly self-explanatory, Clear Management Training plays an important role in keeping our company on the right track. The Anaco team would like to thank trainers Zeydi Gutierrez from AB&I Foundry and Aimee Kenney from Anaco. Great job! McWane is proud that there are so many team members that have been with the company for decades. But it is unique to find a brother and sister with over 20 years of service. 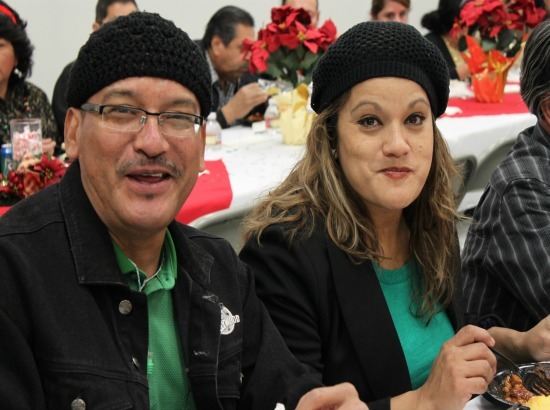 Anaco team members Jorge Arroyo and his sister Georgina Solorzano have worked with Anaco for two decades. Georgina works in the Assembly Department where she assembles couplings and package finished goods. Jorge is the Lead Material Handler and leads in the day to day activity ensuring that departments are fully stocked with the material they need in order to produce the couplings.